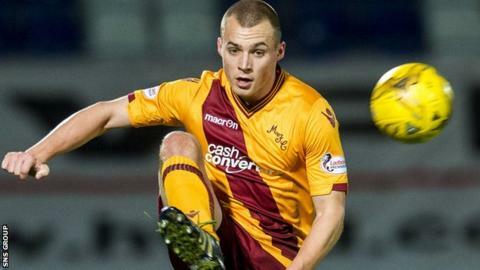 Motherwell's bid to sign Liam Grimshaw has been thwarted as Manchester United prepare to trade the midfielder on. The 20-year-old made 16 appearances for the Fir Park club during a loan spell from Old Trafford. 'Well had hoped to make the move permanent this month, with talks at an advanced stage. But manager Mark McGhee said: "We have been gazumped at the last minute by an English club who offered a package that we simply cannot compete with." Several newspapers are reporting that Grimshaw is poised to join Preston. "We've held numerous very positive talks with both Liam and his representatives about the possibility of him becoming a Motherwell player," added McGhee on the club website. "So much so, our plan was to try and finalise an agreement with Manchester United this week. "Whilst that is frustrating, we completely understand everyone's position. "Liam himself has been fantastic in how he has approached the move and his conduct and performances throughout. "We're naturally disappointed to be losing him, but at the same time, proud of him that he's earned such a good move and wish him every success."